Larger windows with larger panes. Wider use of building materials including decorative cast iron, corrugated roofing iron,plaster and timber weatherboards. Extensive use of verandahs and sun screen devices. Often finials and cresting to the roof. Classical mouldings around windows, doors and brackets under eaves. Often a square tower to one side. Mosaic tile or marble porch and hall floors. Coloured and etched glass windows. 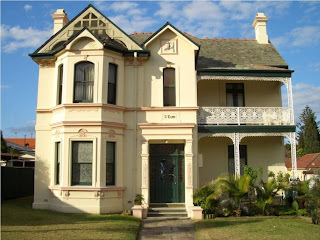 The Victorian period was dominated mainly by Italian influences, and is the most common style seen in the suburbs that developed in this era. The asymmetrical front was a welcome change from the colonial styles. The picturesque Gothic Revival styles, also with a projecting front room, were in direct competition to this classical approach. The use of timber balloon frames, clad in weatherboards and often rebated to imitate stone, spread as the suburbs sprawled along railway lines. Shingles gave way to hipped corrugated iron roofs, with slate used on more pretentious houses. Cast iron lacework was now being made locally in quantities to satisfy demand. Stone and polychrome brick mansions appeared on large elevated allotments, while the working classes belonged to the lower elevations. Nonetheless, new technology played an important role in Victorian architecture, and a wide variety of repetitive ornament became available at the lower end of the market for the first time. Joinery shops could supply ready made components such as sash windows with large panes of glass, moulding’s, doors, pickets, scrolls and brackets, decorative weatherboards, posts, finials, keyholse fretwork, fascias, rosettes and all types of plaster mouldings and cast cement. The eaves, window and door surrounds, chimneys and quoins became increasingly elaborate as the period progressed. The introduction of cavity walls, plate glass and improved water and sewerage systems all fed the impetuous of building growth. In opposition to the tall , decorated Gothic gables, low pitched hipped roofs, bracketed eaves and arched windows were common features. As the style advanced, bay windows and offset verandahs complemented the asymmetry, with the verandahs roofed in corrugated iron in a Regency sweep or bullnose, often painted in a wide stripe to imitate canvas. During the 1880s, as the boom developed, extremely elaborate parapets and an almost unrestrained use of stuccoed ornament became the hallmark of the Boom style. The parapet was often balustraded and crowned by urns. External colour was becoming much more bolder, in the inner suburbs os Sydney, Melbourne and Adelaide, terrace houses were built mainly for the working class and as rental investments, they displayed the ornament without the scale. Interiors were characterised by a central arched passage up to 2.4m wide with a four panel front door surrounded by lead light and etched glass. A heavily moulded cornice separated the ceiling from the walls, which displayed small patterned wallpaper finishing at the picture rail with a heavily coloured frieze above. An abundance of furniture, ornaments, pictures and trimmings filled the front rooms with japaned floors and rich oriental rugs. Gardens evoked a romantic feeling and were boarded by pallisade iron or picket fencing with a variety of decorative tops, combined at times with hedges. This is the first guide to the various styles of architecture that can be found around Rockdale, in following Posts we will try to cover them all.